Hi Mama Elephant fans! 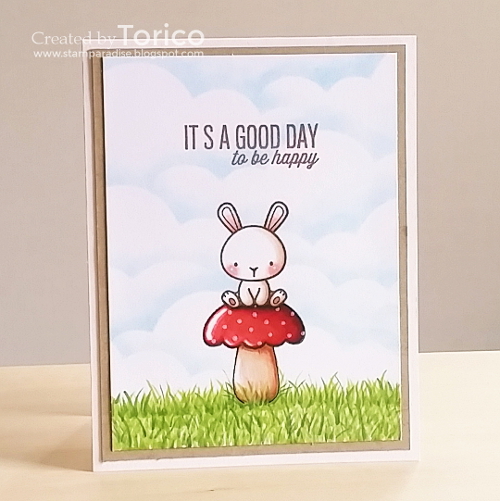 It's Torico here for my guest Designer Series post. First of all I'd like to say a big thank you to Kryssi for giving me this great opportunity to collaborate with you in designing stamp sets! Today I'd like to show you how versatile the CARNIVAL CUPCAKES and CARNIVAL TOPPERS sets are. These sets feature cupcakes and cupcake toppers, and you can mix and match the images in these sets to design your own cute cupcakes. But wait... look at those images carefully. The cupcakes are not only for cupcakes! For my first card I created a baby mobile with a top part of cupcake, which was cut out using the Carnival Cupcake Creative Cuts, and a few tiny images from the Carnival Toppers set. For the background I stamped a sentiment border from the Sentimental Borders set on vellum in white pigment ink. I used the Just Hatched set for my sentiments, which were also stamped on vellum. And the top part of cupcake can be used as a mushroom cap! Stamp a bunny and mask it. Then stamp a mushroom cap (I mean a top part of cupcake) and draw a stem with a gel pen. Mask the mushroom cap too. 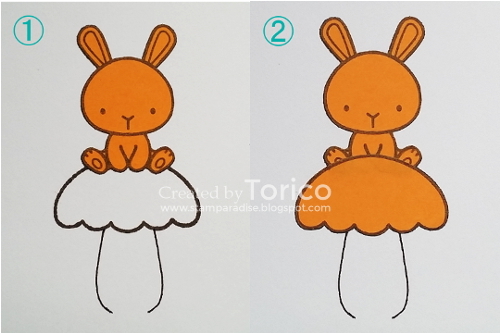 Create a cloud mask with a die from the Landscape Trio Creative Cuts and a scrap of thin card stock. Sponge some blue ink using a sponge dauber to create a cloudy sky background. Remove the masks, color in the images (I used Copics for my coloring), and add the grassy ground. I decided to add some polka dots to the mushroom cap with a white gel pen. The sentiment is from the Up And Away. I hope you enjoyed my cards. Thank you for stopping by! I need to make a mushroom card right now. fab ideas to stretch those frankly gorgeous stamp sets! Oh my gosh oh my gosh oh my gosh!!! 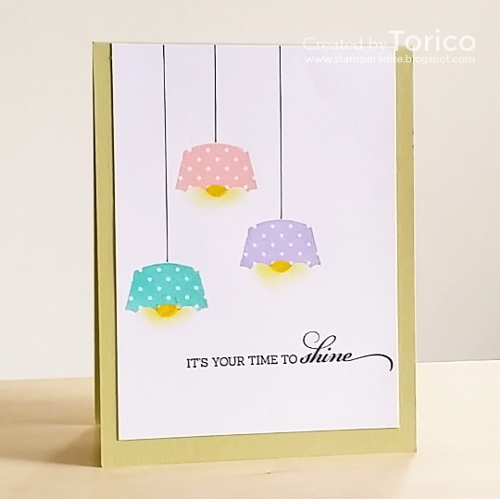 Torico's cards are soooo amazing!! Thank you so much for showing the versatility of these stamp sets!!! LOVE THEM!!!!!! 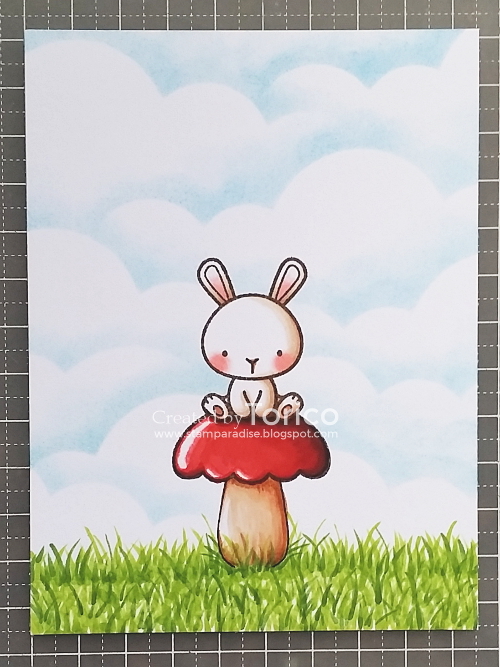 I really like your card with the bunny and the mushroom. Great idea. This is fantastic Torico!! So clever! Love this set! Amazing!! I love the versatility! All three cards are amazing! Thank you so much for sharing all of the awesome different ways to use this set! Holy moley...how clever are these cards. The mobil and mushroom really sang to me. Just brilliant use of this adorable set. Absolutely fabulous! Brilliant ideas, thanks so much for sharing! 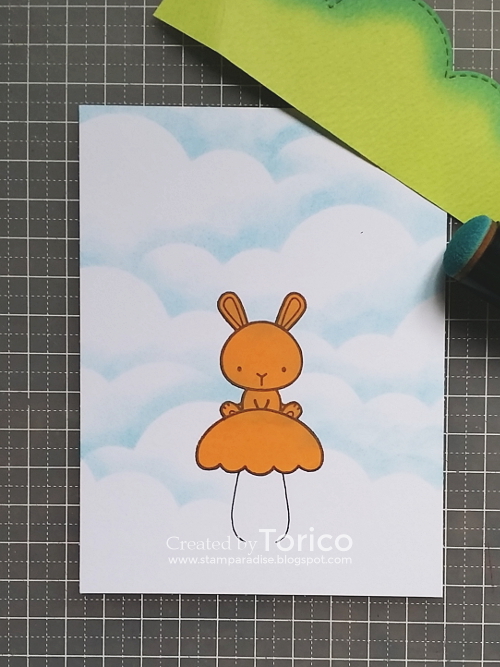 Torico, your illustrations and creativity just blow me away! Love it! all cards are so beautiful! Absolutely darling cards! Thank you so much for sharing all of your ideas with us! These are such awesome inspirational photos of the enormous possibilities with these stamps. Totally blown away! & that you got more use out of the stamps! Absolutely cute, and ever so clever! I love the way you've stretched these stamps! Torico these cards are all amazing and creative!!! !